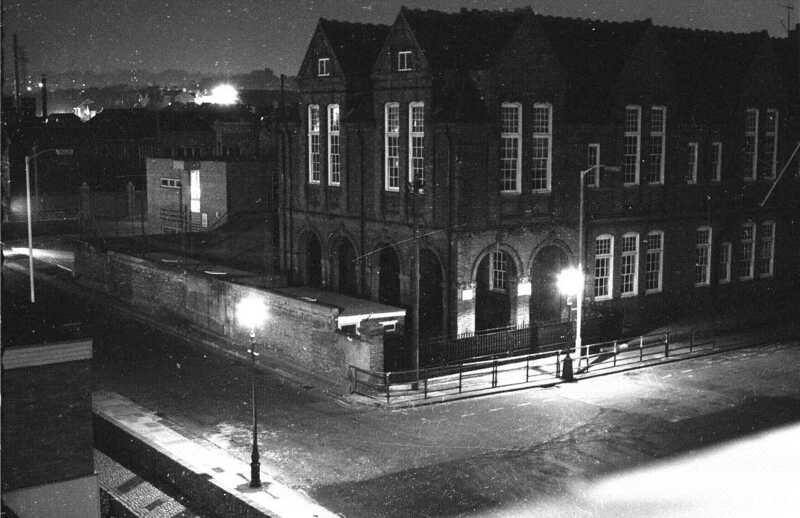 I loved my time at Goldstone Junior School, long before the new flats were built on Ellen Street. We moved into Conway Court in 1968 when the school was still open and took this photo in 1972 (I think!) from our flat in Conway Court after the school had closed. Do you have any memories of the school you would like to share with us? If you have, please leave a comment below. It is heartening to see this lovely photo. The James Gray photo collection has a whole selection of photos of this once lovely part of Hove. A scandalous decision to demolish from Sackville Road over to Ethel Street and from the railway down to Clarendon Road was taken in 1960. Over the next nine years, starting with Conway Court, the ten storey blocks ranged along the north side of Clarendon Road were built. Looking at the collection of photos in the James Gray collection you can see this was no slum area at all. There were some amazing oddities along Conway Street to the north and absolutely beautiful corner entry shopfronts. The wanton destruction of these terraces and the school on Ellen Stret are a lesson to us all. The semi-industrial sheds thrown up in place of the terraced housing behind the Clarendon and Ellen Estate are a lifeless and crime-friendly area now which do not feel safe on a dark winter night. The Cliftonville Pub beside Hove Station used to have its own entrance into public and saloon bars from Conway Street which I once had a glimpse of when the boardings and fencing were briefly removed. A neighbour tells me there were pool (billiard?) tables. The appalling shed-like Rentokil building and its huge empty carpark behind the recycling point replaced the solid substance of this demolished school. I feel quite bitter about the sheer lunacy and wickedness of the decisions taken back in the 1960s. I’ve always wondered if there is a backstory that produced that demolition of an entire chunk of Hove – one involving backroom deals and…..
Tony, do you have any more pictures of the area around Goldstone School before it was all demolished? I’m also wanting to trace any photos of the Park House, Hove Park Gardens homes on Old Shoreham Road between Hove Park and the Rec, if anyone knows of any. Valerie, I have sent the editor another photo of Goldstone Junior school and hope it will be published soon. I visited Ellen Street recently and as you say it is a great shame to see my old school no longer proudly standing there but replaced instead by a car park and some old industrial buildings. I am trying to contact any person who was in Mrs Brewer’s class in and around 1958 -1961. This brings back memories! I am assuming that the picture is taken from the south west corner of the school? If so, is my memory amiss as my recollection was that the houses continued alongside the school almost back to Sackville Road? I remember the sweet shop, Bullens – I was telling someone only the other day we had this wonderful shop which had boxes of sweets for a farthing, halfpenny, penny etc – what amazing memories! Can anyone help with something that I am keen to try and sort out? It is a recollection of outings – they may have been from Ellen Street and/or Connaught Road Infants school. I have a recollection of going to a place called “Boxers Gardens.” My sister Alison remembers them and thinks it may have been at Hassocks but neither of us has any further information. Can anyone else recall them and if so, have you got any further information on the place? I was a pupil at Goldstone Junior School in Hove and enjoyed my time there. I was at Goldstone from 67-70, and was in Mr Lovatts class, (wonderful man – I remember him getting us to make a huge model of a saxon village as a whole class excercise), then Mr Church and finishing with Kay Henderson in 4a, whom I remember as a rather strict redheaded lady you wouldn’t want to cross. I remember the gradual demolition of the old terraces while I was there, our school lessons accompanied by the sound of the wrecking ball, and the smell of burning lath and plaster. Between 67 and 70 the area turned from a sooty victorian “Coronation Street”, to the brave new world of the Ellen Street flats. Even then I had mixed feelings about it all, despite having lots of lifts to play in! I was a school “bad lad” along with Adrian Ives and Christopher Monk, and we would usually get the blame for any unexplained act of vandalism (often they were right) and end up either getting a dull lecture from Mr Muggeridge, the rather disinterested headmaster, or being ferociously slippered by the terrifying Mr Mitchell, a red-faced Canadian deputy head who, I think, rather hated the 3 of us. Despite all this corporal punishment I dont think it did me any psychological damage, and was just seen as an occupational hazard. The worst thing we ever did was flood out the brand new loos, which had just been built under the arches at the western end of the building. Its hardly surprising that Mr Gale, the poor caretaker couldnt stand the sight of us! I dont know how I managed to pass my 11-plus. The bad lad stuff ended at BH&S Grammar, which was an altogether more daunting establishment, and not to be trifled with! Happy days…. I think. I lived for the first 5 years of my life at 64 Ellen Street, then the council compulsory purchased it, knocked it down and built the Ellen and Clarendon Flats. Does anyone remember the public baths nearby? My father attended Ellen Road School from 1896-1904. When did it become Goldstone School? Thank you Mark Thompson for bringing back so many memories of my time at Goldstone Junior School. I also have fond memories of Mr Lovatt (Lovett?). He would take us all swimming and I remember him taking the lead with his towel rolled up under his arm and leading us down Sackville Road to the baths (King Alfred). I also remember Mr Church, Kay Henderson, Mr Gale, Mr Muggeridge and Mr Mitchell who also gave me a good slippering in front of the whole class for simply giving a wrong answer! I also remember Adrian Ives who was always inventing things and I remember he would (if asked) make you a light that consisted of a small battery inside a round tobacco tin with a bulb protruding from it. I also remember Christopher Monk. Bullens, the sweet shop is a fond memory too, we all used to pile in there and spend our halfpennies etc on their lovely sweets – I remember Bazooka Joe bubble gum was a favourite! I vividly remember being in Mr Spain’s class in 1962. He had a swear box which any child who swore had to pay money into. At the end of each term the money was shared out to the whole class. This was great for those who (like me) never swore, as we got a payout. he also played impromptu cricket matches at the front of the class with children who had finished their work while the rest of us finished off. I also remember the yo-yo biscuits. I went to Goldstone ’57 to ’61. Lived in Conway Street which backed onto the playground, remember the streets getting demolished. A few memories I have are all pretty good: the old rag and bone man shop where we used to sell old newspapers to him, the laundry opposite my house, the wood yard, the Salvation Army, and of course the sweet shop – 1 penny arrow bars, black jacks, tiger nuts – the list goes on. I attended Ellen St. from 1954 – 1957 and reading other people’s comments have brought back many good memories. Mr. Mitchell was great, Mrs. Canneaux? who taught music – a very sweet lady, Mr. Wallace and his scripture classes where we sat three to a desk, hoping against hope that we wouldn’t be called upon to answer a question. Visits with the school nurse to check for head lice and the invisible line through the playground to separate the boys from the girls. My memory is a bit fuzzy about Bullens – I definitely remember the shop but was it the one in Sackville Rd. or Ellen St.? I remember a shop just east of the school where we bought iced lollies and we would hope that we got one with a stick that gave us a free lolly. I particularly liked the bright turquoise ones which left quite a stain on your tongue! Reading many of the former pupils’ past experiences at Ellen Road Junior School has unlock many wonderful memories. I attended from 1954-1957. I can remember the headmaster Sidney Smith, also Mr Wallace who always looked stern, but I was fortunate to have Miss Wallace (not related to Mr Wallace) in the 2nd and 4th year. She was like a mother to the whole class. I can also remember some of the class, namely Mark Powell, Derry Fisher, Bruce Hood, Malcolm McNair, Judith Smith, Majorie Hutchingson, Diane Atkinson and Susan Gray. I do remember the sweet shop and ice lollies and hoping to get a free one. I can recall taking part in a show/ display just off Sackville Road. Sorry I cannot remember the name but I think it begins with B. It’s great people can still think of the happy times there, even though most of us are in our late 60s. Having spent my early days living in Poets Corner many moons ago, Ellen Street was my school. In answer to Tony’s question the cake shop on the corner near Bullens was called Holders. I know this as my Nan used to send us up on a Saturday early to buy Fleed cakes – they were lovely and soon sold out, hence going early. I can remember Mr Gale the caretaker – he was very nice. I was friends with his daughter Rosemary . A teacher I remember most was Miss Clothier – she was very nice because not liking milk she brought some Bournvita to put in my milk therefore I drank it and enjoyed it. I have never forgotten her . I was at Goldstone until 1968 when I moved on to Davigdor, also now sadly demolished. In those days I was Ann Ritchie, and my brothers, Ian and Neil, and I all lived at the old Fire Station in Hove Street. I vaguely remember Mr Moss. I remember walking to school one winter in very deep snow. I was at Ellen St school in 1940. Mr Sidney Smith was headmaster then. As a senior I then went to Connaught Road. There was a danger of the gas holder being bombed so they moved us all to Davigdor school in the infants side. I arrived at Ellen St in 1947-48 from Holland Road infants, and it was then East Hove Junior Mixed, if I am right. Sidney Smith was the headmaster then and some of the teachers I remember were Mr Rawson, Miss Abbot and Mrs Canneaux. One thing I do remember was that if you got caught doing something naughty and had to go to ” Smithy” you had to stand outside his office. The wall was painted green. While you were standing there some of the other kids, as they walked past, would stand in front of you, lick the first two fingers on each hand and then fall towards you with arms and fingers outstretched, so that their fingers hit the wall either side of your head. That was a good luck “charm” to stop you getting the cane, and I have to say it worked for me every time. Another thing I remember was buying Horlicks tablets from the sweet shop for a halfpenny. I liked that school, far superior to the Brighton Building School where I next moved on to in 1953, with a close friend Keith Stewart. Sadly he passed away ten years ago but the memories of Ellen St live on. I remember ‘old Goldstone School’ as I used to call it. I loved that school. I started there earlier, 1970s. I remember Mr Muggeridge the headmaster and I seem to recall that he had a lazy eye. Miss Henderson, the teacher with the red hair, seemed nice. Mr Lovatte was my form teacher who also taught us Biology and in our classroom was a tank where he kept slow worms. I remember the days he took the class swimming to the King Alfred with his towel rolled under his arm. He had a beard too – a lovely teacher, very helpful! Also the playground was separated by a metal fence – one side for girls, the other for boys. And we had to keep an orderly line when walking up the stairs and not run – they used to have prefects watching us at the top of the stairs. I was also at this school and was in my final year before it was knocked down in1974. I remember it being 99 years old when they demolished it. We used to play stool ball in the separated playground, as mentioned above one side for boys and girls, before all going into the same classroom together, seems strange now. I remember the caretakers had a little dog they used to bring into work. Mr Muggeridge did have a lazy eye, in assembly when he used to shout out ‘ You behave’ we never knew who he was looking at! There was also a wooden stage or staggered classroom for Geography lessons . Fond memories of childhood there and a grand Victorian building. I remember Goldstone Junior School as I taught there for a year (Mrs Brown) in 1973-74. Lovely kids in my class including one Rebecca Askew who suddenly popped up in a show at Manchester Library theatre about ten years ago as part of an organisation called The Shout, who were brilliant, creative musicians and performers. Mr Muggeridge was an excellent headmaster (and, I think, a Humanist) but retired while I was there and was replaced by a younger model. One of my other pupils was called Suhaela, and after I had used ‘Lord of the Rings’ in storytelling time, would write in nothing but Runes. Frankie Potter was a very bright girl – what happened to you all? I went to Ellen Street School in the early 1950s until 1955. We lived a fair distance from the school so was given money for the bus, but I usually walked and spent the money on sweets in Bullen’s. My favourites were sherbet fountains, lemonade powder and gob stoppers, all excellent for rotting teeth. I only had one encounter with headmaster Mr Smith when the whole class was marched off to his office. We lined up on the stairs awaiting our turn. I don’t remember our offence, maybe our teacher Mr Wallace just got fed up with us being rowdy. One playground pastime I remember was making holes in the soft red bricks of the walls with a penny. Then we used the brick dust mixed with a bit of spit to polish the penny. The bus conductors used to look very suspiciously at the shiny coins when we offered them. I was at Goldstone from 1965 to 1969. I remember Ann Ritchie and her flat at the fire station. I also went onto Davigdor Secondary Modern in Sept 1969 and was there until 1974. I was in the B stream all the way through school but can remember a few lessons with Mr Spain, who usually taught 4a. An evocative photo, was there from 1966 – 1970. I was at Goldstone from 1972 to 1974 when it closed and went to Somerhill after that. I remember the name Frankie Potter. As I recall, I was in Lewes Castle – the others were Bodiam, Pevensey but I can’t remember the 4th one.